Black History Month. Beyoncé’s Superbowl Half-time Show. The Black Lives Matter campaign. These recent events have been shaping my intentions with my AmeriCorps service. 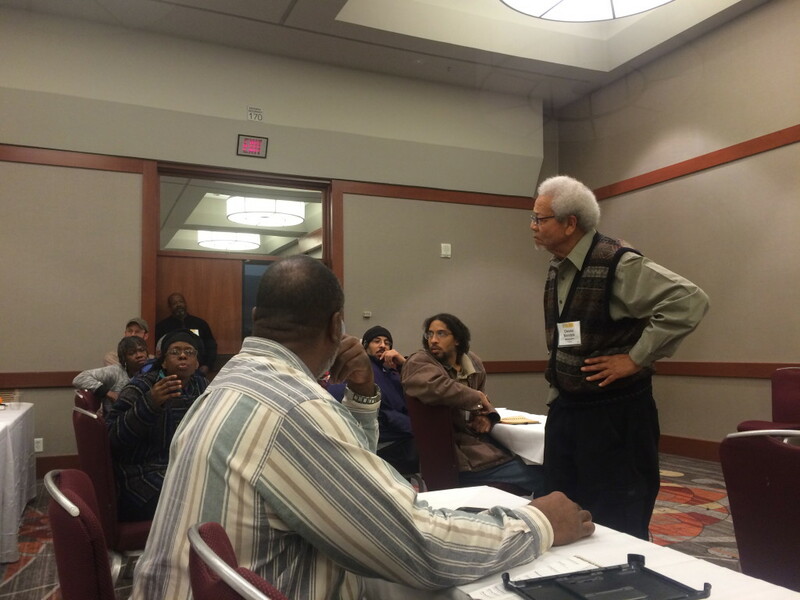 I was recently fortunate to dive into a deeper conversation with people of color in farming at Southern SAWG’s (Sustainable Agriculture Work Group) conference in Lexington, Kentucky. This January, Organic Growers School was supported by SARE (Sustainable Agriculture Research & Education) with a scholarship to attend a three-day long conference at Southern SSAWG’s Practical Tools and Solutions for Sustaining Family Farms in Lexington, KY. The conference is an annual event that provides a forum to learn about sustainable farming techniques and marketing strategies, community food systems, and federal farm policies and programs that promote sustainable agriculture. 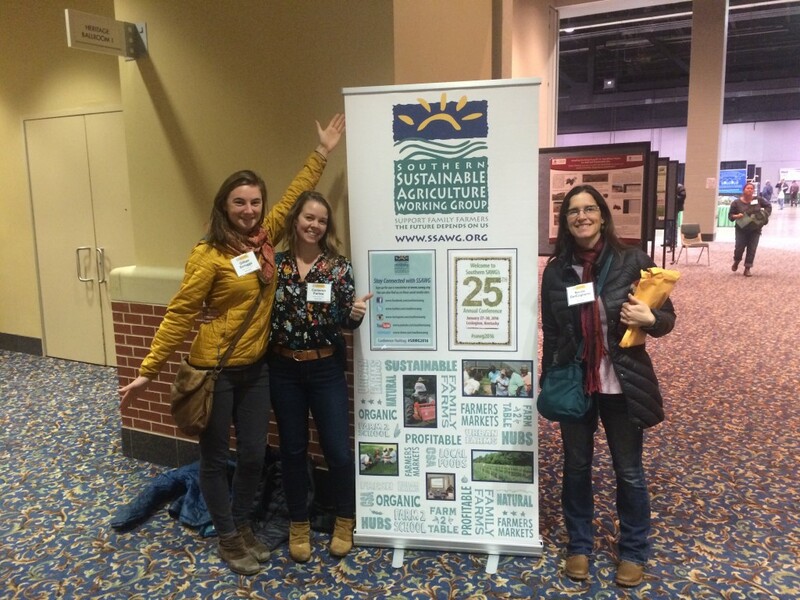 Gillian, Cameron, and Nicole at SSAWG! Southern SAWG’s mission is to empower and inspire farmers, individuals, and communities in the South to create an agricultural system that is ecologically sound, economically viable, socially just, and humane. Attending this conference was a wonderful opportunity for me to plug into what other communities in the south were actually working on to contribute to a system of sustainable agriculture. And because I am not a farmer, I opted to attend sessions with a specific focus on supporting sustainable agriculture in diverse communities. Having lived for the past nine years in segregated and homogeneous areas (Western North Carolina and rural Idaho), Southern SAWG’s multicultural, inclusive atmosphere was inspiring to me. A Sixth Generation Renewing Their Relationship with the Land — Because of racism and discrimination, land ownership and retention has been a challenge for African-American farmers. Althea and Matthew Raiford—siblings who own Gilliard Farms in Georgia—had a great, great, great grandfather, Jupiter Gilliard, who held onto 476 acres of land in 1874 with a tax payment of $9. Althea and Matthew returned to that land in 2011 and work on 28 of those original acres, raising vegetables, fruits, and heritage animals. They are re-energizing the farm and their lives through their relationship to the land. People of Color in Farming and Food Systems Work — a facilitated group discussion to address the questions: How can more People of Color start farming or become part of the sustainable food and agriculture movement? What are the barriers? Land loss and ownership issues are especially common barriers to farmers of color. Land ownership is vital to all communities. It represents power. Too often older farmers of color are afraid of signing over their land to successors when they die, for fear of being coerced or taken advantage of, and losing that power. When a person dies without a will, or other type of estate plan, state law controls who can rightfully inherit and how much they can inherit. Land that is passed down to heirs according to state law is commonly known as heir property. Each heir will inherit a fractional ownership interest in the land. With each passing generation of heir property owners who die without a will or other estate plan, a new generation of heirs inherits ownership of the land. Typically, each successive generation is larger than the previous one. With numerous owners, and the land parceled out into small pieces, it can become nearly impossible for the land to be properly managed. This is seen as one of the most common ways that farmers lose access to their inherited land. There is a need for older landowners to be educated about their options for what they can do with their land. The United States Department of Agriculture poses solutions as well, but there is a long history of distrust amongst the USDA and farmers of color. Visit this site to read about the 1997 class action lawsuit of Pigford vs Glickman. Our elders are the holders of great wisdom. We should reconnect with the elders if we want to reconnect to the land. Althea Raiford pointed out, “Urban farming…. Black folks have been doing container gardening since they moved from the south to the cities up north. It isn’t new.” There is nothing that you as a farmer is doing that hasn’t been done by someone else before you. There is only so much we can learn from reading books, from watching YouTube videos, and reading beautifully crafted blogs . We have to figure out how to have that conversation with our elders. If we aren’t listening, we aren’t going to hear it. There is a need to change the mindset of young generations. In my AmeriCorps service with Organic Growers School I am personally working to continue my understanding and engagement with issues of race, food policy and land access. This April I am helping to coordinate our 3rd annual Earth Day Film. OGS is partnering with local nonprofits Green Opportunities and Bountiful Cities for a screening of the recent film “Can You Dig This,” featuring renowned “gangster gardener” Ron Finley. As part of an urban gardening movement taking root in South Los Angeles – one of the largest food deserts in the country – people are planting to transform their neighborhoods and are changing their own lives in the process. Our intention in showing the film is to inspire the community to get growing and to introduce a few local nonprofit organizations that are actively striving to find solutions to support sustainable agriculture and urban food systems. Join us in April to continue this important conversation!